Pleasurewood Hills Family Theme Park01502 586000 work Theme ParkPleasurewood Hills has over 35 rides, shows and attractions so there’s something for everyone whether you’re a thrill seeker or not! The younger family members will have a fantastic time exploring the Kiddie Zone with its rides which are suitable for children around one metre tall, while the family friendly rides are the perfect introduction to the theme park world. And if you prefer a more extreme day out, there’s a choice of rides including Wipeout – the region’s most extreme roller coaster. For some Western-themed fun, head to Main Street and try your hand at the Rootin’ Tootin’ Target Trail. The whole family can join in as you ride along the UV lit route and shoot at the laser targets placed around the track. This year, one of the park’s most iconic rollercoasters will make a return when it takes to the tracks again. Having made a name for itself as the Rattlesnake and Ladybird, the rollercoaster has a brand new identity and will be known as the Egg-Spress. The news that the ride will be making a return to the park means a whole new generation of people will be able to enjoy the twists and turns of this fantastic ride! When it’s time to take a break from all the action, little ones will love visiting Woody’s Cub House, a brilliant indoor play area. There are lots of places to climb around and children who are 1.5m tall and under will love exploring the Cub House. If you prefer to take things at a slower pace there are plenty of things you can enjoy too! Hop on the chairlifts and enjoy the view as you take a ride across the park, grab a seat on the trains and make your way around the park at a leisurely pace. You can even sit back and enjoy watching the fantastic sea lion and parrot shows which have been keeping audiences entertained for many years. The High Dive show will make a return to the park later in the year. Audiences were wowed by the team’s perfectly timed choreography and amazing stunts and this year’s group of new performers are sure to bring their own unique style to the show. Additional themed weekends and events will take place during the year - keep an eye on the Pleasurewood Hills website and social media pages for details. Watch out for Super September and Pleasurewood Chills – a fang-tastic week-long Halloween themed celebration over the October half term. Pleasurewood Hills has over 35 rides, shows and attractions so there’s something for everyone whether you’re a thrill seeker or not! All prices can be found at www.pleasurewoodhills.com. 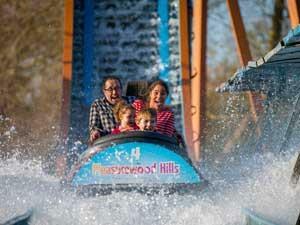 Pleasurewood Hills is conveniently situated off the A47 between Lowestoft and Great Yarmouth. Local buses run to Leisure Way, park is a 5min walk from the Tesco Store bus stop.